Hope you all well..I will be on a visit to India and back in 4 weeks. However will try to stay connected with you all as and when time permits and plan some scheduled posts. Do stay connected and visit my blog. I will look forward to your feedbacks. 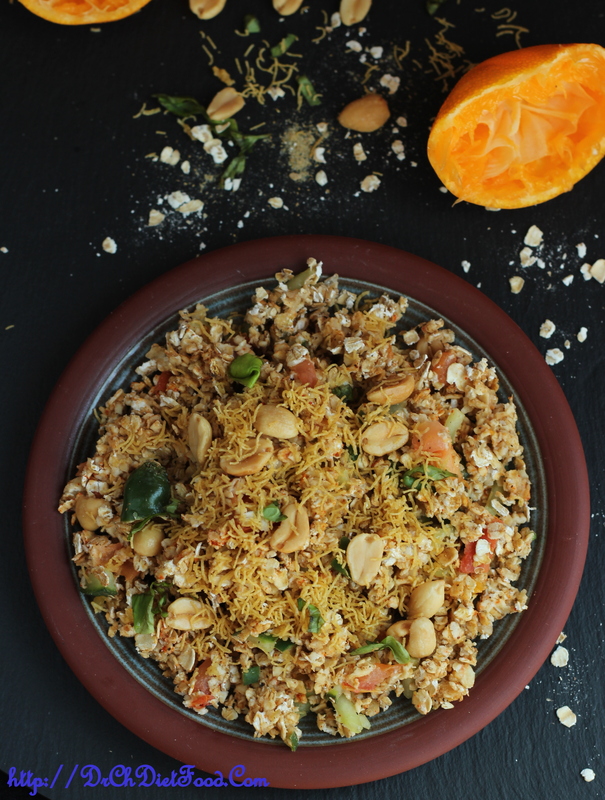 One always looks for a healthy breakfast recipes and sometimes for snacks…This recipe is inspired from Indian bhelpuri chaats. I have customised with an addition of fresh orange juice, so you get all tangy and savoury taste in this recipe. Oats can help keep your body lean and strong because it is full of fiber that keeps your stomachs fuller longer. Also helps to lower ones Cholesterol and blood sugar levels. A US research lab found that Drinking orange juice along with oats meal cleansed arteries and prevents heart attacks with twice efficiency than consuming just bowl of oats. In a pan add oats and fry for 3-4 minutes/ until slightly brown. Posted on August 10, 2015, in Indian, Starters and tagged Bhel, drchdietfood, healthy bhel recipes, Healthy breakfast recipes, Healthy chats, healthy street food, Indian snack, oats, oats indian recipes, orange recipes. Bookmark the permalink. 26 Comments. I didn’t know that about orange juice. I wonder if it is true with any other fruit juice. At any rate, it looks like a delicious breakfast. 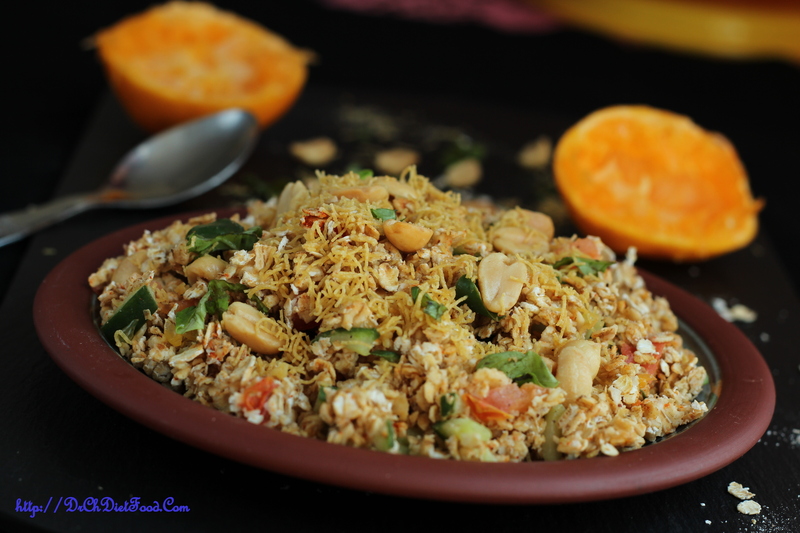 Love this clever idea of making bhel with Oats! Thank you! I have seen many variations of oats, but this is new even for me. I also have friends who eat it with orange juice! Have a wonderful time home in India Chitra. Stay safe and see YOU soon! Sounds delicious Chitra – I never drink oj because of all of the sugar even though I love it! Enjoy your vacation Chitra 🙂 This looks lovely! Thanx a lot Nancy. ..had a wonderful trip… Thank you..